In the boxes: Homemade fried wanton, pork rolled with radish & carrot, beansprout, cherries & a love candy. I am trying to come up with a Valentine's bento but my brain has not been working well lately.... 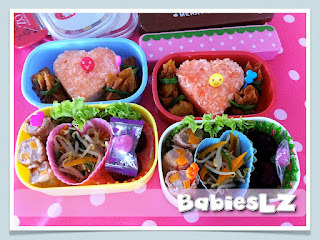 So made a simple heart bento for LZ. Naughty little one almost finished off all the beansprout while I was busied in the kitchen. Lucky I was able to stop him in time, otherwise my older ones will not have any veggie in their bento today! Phew!